Nonno's Ristorante features authentic Italian cuisine, boutique wines, and more. It is our commitment to provide you with the freshest, natural foods available. Nonno's Ristorante offers indoor and outdoor seating. Welcome to Nonno's Ristorante! We're proud to offer a wide array of authentic Italian dishes and desserts made from the finest ingredients available. Our boutique wine list features selections from local area wineries including Wines and Robert Renzoni. Visit us for dinner, wine and ambiance. Buon Appetito! Nonno's Ristorante received the Certificate of Recognition, in honor of providing outstanding service, food and hospitality, by the California State Assembly, as well as a glowing review from The Valley Business Journal. Join our wine club to receive special offers and discover new wines each month at Nonno's Ristorante. There is no better gift that a Nonno's Ristorante gift certificate. Surprise your loved ones with the gift of great food. Every Wednesday is date night at Nonno's Ristorante. Enjoy two entrées, a bottle of wine, & a dessert for $49.99. Join us Sunday - Thursday (4 - 6pm) and receive 50% off on wine by the glass, beer, well drinks, and select appetizers. We use Reservation Genie to manage online reservations at Nonno's Ristorante. Book a table now by using the widget below! Nonno's is located between Murrieta Hot Springs Rd and Medical Center Dr. Book your table and come see us! Lunch: For private events or caterings only. Closed on Christmas Day, New Year's day, Thanksgiving, and Easter. All other Holidays hours maybe different please call for special hours. Online gift cards are an easy and convenient way to give a gift to your loved ones. 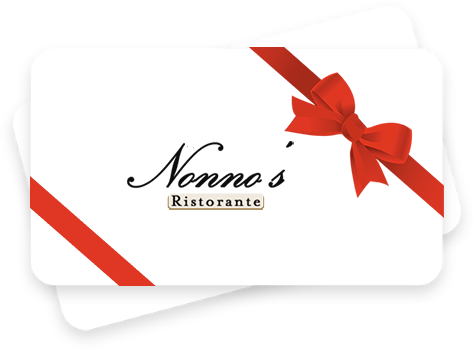 We use Reservation Genie to sell gift cards online at Nonno's Ristorante. Managed by Top 20 Austin Restaurant Guide and Best Things to do in Austin.